While planning September’s fence building project last summer, I decided early on to try and use materials cut from the property, and knew I’d need tools to peel logs. I didn’t know exactly what I’d be up against, so I bought an 8-inch drawknife and a short-handled bark spud, thinking what one couldn’t handle the other maybe could. They were the perfect tools. I got lucky, really, getting one of each, as the drawknife couldn’t get into the flutes of the cedar logs like the bark spud did, and using the spud alone would have been murderously slow. But together, between Skidder and I, we peeled logs like we’d been doing it our whole lives with those two tools. I was very pleased with how they worked out. Was it hard work? Depends on what you consider to be “hard,” but yes, we worked up a sweat. Was it slow work? Again, it depends on what you compare it to. 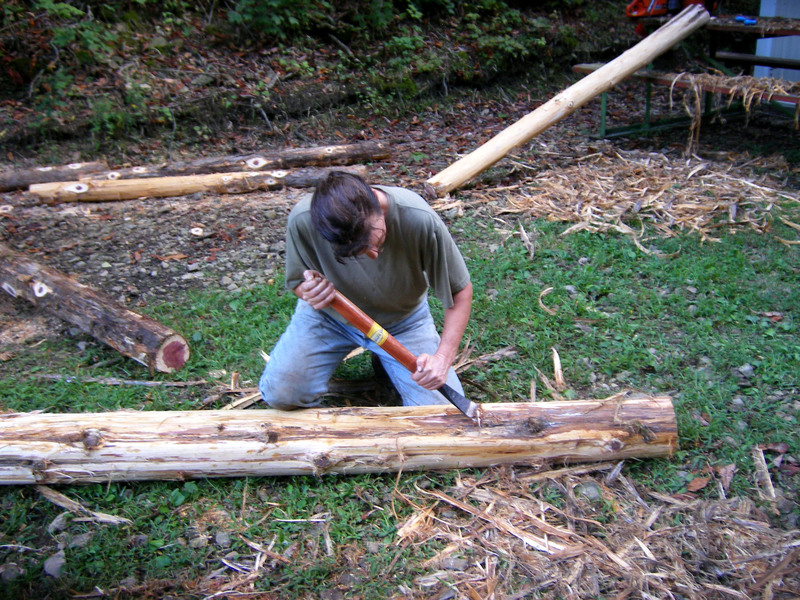 We caught on pretty quickly and learned how to position the logs against a sturdy picnic table, and let the tools do most of the work instead of our backs. The last couple of rails I peeled went much faster than the first two. 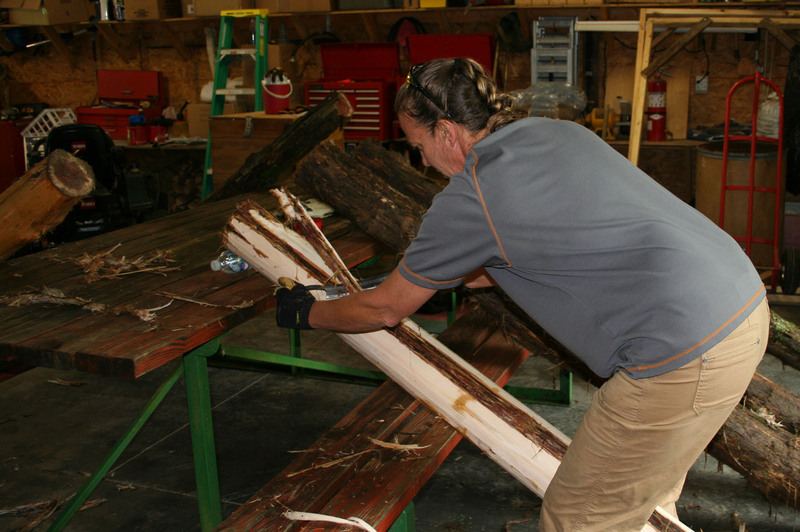 We weren’t putting up hundreds of feet of fence, so peeling the logs and rails by hand wasn’t a show-stopper for the limited amount of time we had; I’d say it was neither slow nor fast – just right. I just smiled and kept peeling. September, nearly over now, was stacked to the rafters with doubled-up activity; a month that should have been two, in all fairness. It goes that way sometimes. I dove in headfirst beginning in early August, planning the Farm trip and project, chasing endless details that shifted priorities like dune edges in the wind, trying, as they say, to keep my eye on the biggest alligator closest to the boat. Added complexity sprang from the background of an increasing workload at the squadron, fueled by end-of-fiscal-year deadlines and requirements. It really wasn’t a good time to be away for 10 days, but the timing wasn’t flexible for what needed done. And so we got it done, and done well, but my reporting of it languished horribly. Thank you Jeff, for checking in to see if all was well and asking for an update. I am long overdue. 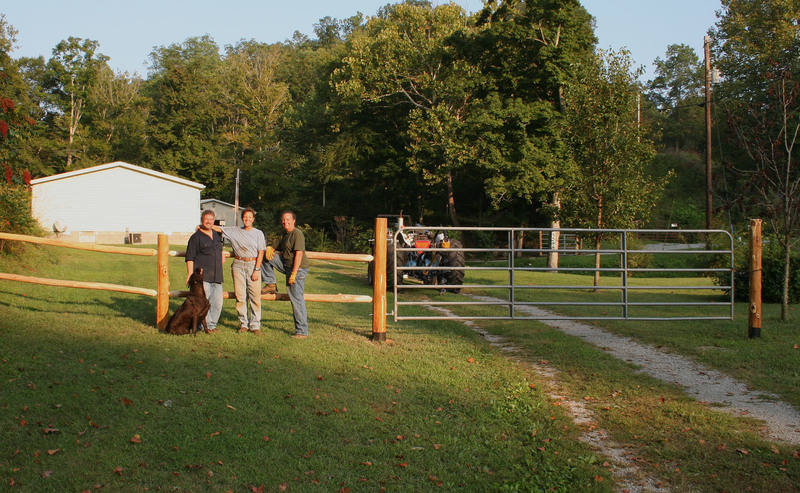 The fence and gate in the picture above are not the whole story but they represent the satisfactory completion of what we set out to do this visit: make the property secure for the periods of time we will not be there. It is good we stuck with this objective, as Bobby and Alene made one more trip out to Oklahoma while we were at the Farm, bid on a house while they were there (telling us nothing about that as usual, until weeks later when their offer was accepted) and have finally, finally, decided to move completely out of the area. Apparently Alene’s desire to be closer to her kids and grandkids won out over Bobby’s preference for remaining in rural Kentucky. And so it goes. My sister found time to travel out from Colorado to help me with the fence and gate project, five working days the likes of which I’d not experienced in quite some time. We were determined to have both gates and at least a section of fence up before she had to leave, and worked like monsters from dawn to dusk – my gratitude is unending for her contribution of time, talent, and extraordinary effort. Lord knows I could not have gotten the job done without her help. For the fence and gate posts we found good-sized cedars in abundance on the south slope just up the road from the shop; I cut and she skidded, earning the nickname Skidder in my post-trip photo captions, and so Skidder is how you’ll know her here. 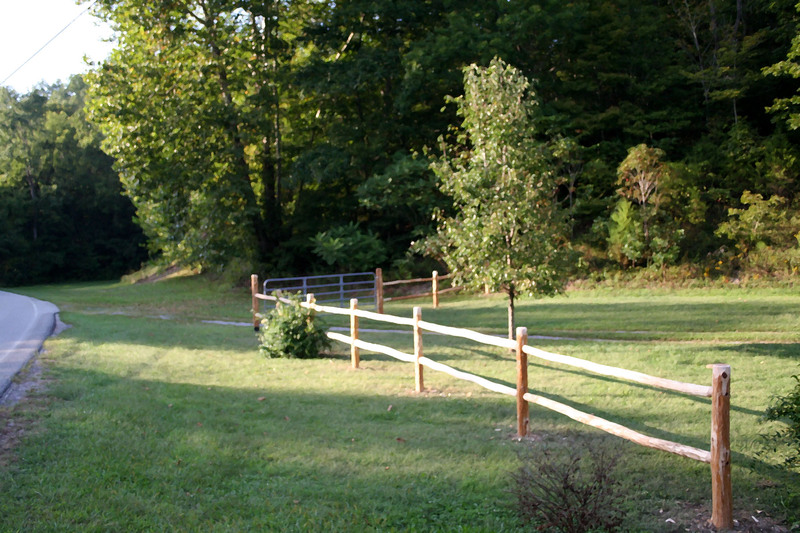 She brought her camera too, so we were able to capture most of the project from start to finish, from laying out the postholes to hanging the gates and building a log rail fence from my own trees. My better half pitched in with the breaker bar on some of the gnarly holes – Kentucky has more than its share of rock – and helped me punch the six postholes for the stretch of fence alongside the road; but his major contribution was culvert maintenance, both on the road up the hill and at the driveway entrance to the state road, where July’s flash flood had washed things out and nearly buried the culvert to the creek. (One of the great surprise discoveries about my husband is his affinity for running a shovel. You wouldn’t know it to look at him, you’d think he’d be allergic, but he’s taken on this culvert maintenance thing with an impressive level of initiative, for him. I do not argue, I praise. And happily go about my building projects, asking for an extra hand only when absolutely necessary). The house and shop now has an alarm system installed, with a loud siren that goes off when it’s activated, as well as a monitoring service that calls the local Sheriff as well as my cell phone. We accidentally tested that feature when Derril showed the folks how the system works; he set it off without calling the monitoring company and a cruiser with a big burly deputy showed up in five minutes. Nice feeling, that. I apologized and assured him we would call first next time, but it was good to know the response will be there if and when it’s needed. I will have to make a quickie trip back out mid-October, once the folks have moved out, to set up the inside timed lights, set the alarm, make sure the gates are all locked, and transfer the electric service over to my account. Since it’s a rural electric coop, I have to apply for membership in person, and I didn’t get that done this last trip. Bonus for me: the leaves will be turning, a sight I’ve never been there to see. I’m also going to rework the farm website’s project page (see A Farm of My Own: Bear and Thistle Farm, at right) and post a detailed description there with photos, as it was a huge learning experience for me and I was delighted with how all the tools performed. This blog post would be enormous if I were to lay it all out here.